The residential site consisted of a main house in reasonable condition, a number of houses which needed to be rebuilt completely, the remnants of an ornamental garden, and a large vegetable garden. The first step was to fence the property to stop the sites being vandalised. The main house was then redesigned and now has variously sized rooms used by the nurses and management. The redesign meant that an extension had to be included in the plans to allow for a consulting room, a new and spacious kitchen with pantry, and a laundry room. Mike Rossiter, an architect in Johannesburg volunteered to draw up the plans. Mrs Mphonyane Litlhakanyane volunteered to execute the Quantity Survey. Tšoelopele Consultants and Contractors were selected through competitive tender to undertake the work, both renovating the main house and rebuilding the nurses’ and manager’s flats, supervised by one of the Trustees who is an architect. The Trust decided that the completed renovations would be a milestone to be celebrated, and an occasion to demonstrate achievements to date and the need for further support. An Open Day was therefore organised for Friday 6th August 2004, as successful event attended by government and local officials as well as representatives of the donors. Of the remaining structures on the site only the walls were standing. Flats for both the nurses and the manager therefore needed to be completely rebuilt, each consisting of a bedroom, a bathroom and. a living room with kitchenette. The structure which now houses the Reception Centre had to be extended to incorporate three separate rooms for waiting, consulting and counselling, plus a veranda. The Intercon Trust undertook these works at a subsidized price. By 2007 it had become apparent that another building would be required, to enable the Centre to offer Voluntary Counselling and Testing (VCT) as well as to distribute ARV drugs. The Trust therefore sourced additional funds to construct a VCT Centre which contains a counselling room and pharmacy as well as the manager’s office and a shower room for employees. Since the Paballong Centre is in the rural area, it is not connected to any utilities, such as communal water, mains electricity, telephone or sewerage. This provided the Trust with a good opportunity to introduce sustainable and eco-friendly methodologies which would also minimise running costs over time. 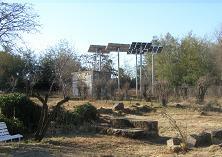 Solar electricity is used to pump water from a specially dug borehole (100m deep) to two storage tanks. To supplement this water supply a number of rain tanks are attached to the roofs of all buildings. To heat water for bathing and washing nine solar water heaters are installed on the roofs of the buildings. A set of photovoltaic panels charge batteries, which are connected to inverters which transform 12V DC into 220V AC. All houses are wired for 220V, so that, if in future Paballong is connected to the main grid, rewiring will not be necessary. The present system provides electricity for lighting and minor electrical equipment, such as radios, TVs or computers. It is not sufficient to provide for heating or cooking. A small back-up generator has been installed for those instances when a power tool needs to be used, or when the weather is overcast for any length of time. The agricultural sector has four aims: to provide food for use in the Centre; income from selling the surplus; occupational therapy for the patients; and training in home gardening and animal rearing. This sector has been funded mainly by the Embassy of Finland. The Trust built animal houses: two chicken houses (for broilers and layers) a piggery, a rabbit house and a cow shed. 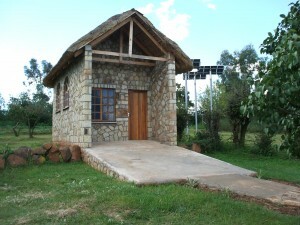 A store was also built with three rooms to keep furniture and equipment for the Centre, feed for the animals and agricultural equipment, and agricultural produce.Two gardeners were employed from 2005 and started rearing chickens (for meat and eggs), rabbits, pigs and cows (for milk). The Centre is now also rearing some ducks, geese, turkeys and likoekoe chicken. 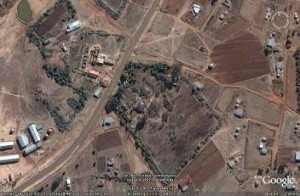 The arable farm grows a variety of vegetables for human consumption, plus maize and lucerne for animal consumption. 150 fruit trees have been planted so that in future apples, peaches, plums and pears can be harvested. A green house and shade house have been built to assist germination and preparation of seedlings and crafting of cuttings. Because the Basotho know many health-supporting herbs, a herb garden is being developed, which could, in future, be extended to offer to herbalists those herbs which are in danger of extinction in the environment. As healthy food is an essential component for HIV/AIDS treatment, the Centre wishes to encourage families affected by HIV/AIDS to grow their own fresh vegetables and rear their own small animals. Therefore, a demonstration garden has been developed, consisting of two keyhole gardens and some trench vegetable beds, plus a chicken house and a rabbit house built from local materials. All sewerage and animal waste is collected into a large biogas digester. This produces gas for cooking in the kitchen and waste water, which is nutritious and safe to use in the garden. The farming section uses no artificial fertilizers and insecticides, but, inspired by the Machobane Farming method, uses compost and manure as fertilizer and intercropping to reduce pests. Thus the Centre can show, advise and train the patients and their caregivers on how to have fresh food available all year round. The area around the houses forms the recreational garden, where patients and caregivers can enjoy the quiet and beautiful surroundings, which in itself is therapeutic. In September 2007 the National Work Camps Association celebrated its 40th anniversary by helping the Centre to improve the garden.